The code above can be divided in 3 parts. While looking through the new features and improvements in SQL Server 2008 Management Studio (SSMS) we found a potentially interesting one called Missing Index Hints. Database Developers and Administrators can use Missing Index Hints feature to quickly identify the columns on which adding an index can help running the query faster. Can you give us a detailed explanation of how we go about using Missing Index Hints feature? Identifying missing indexes is always challenging for a Database Administrator. In SQL Server 2008 Management Studiothere is an excellent feature to identify missing indexes for a particular query when the T-SQL code is executed within the Query window. 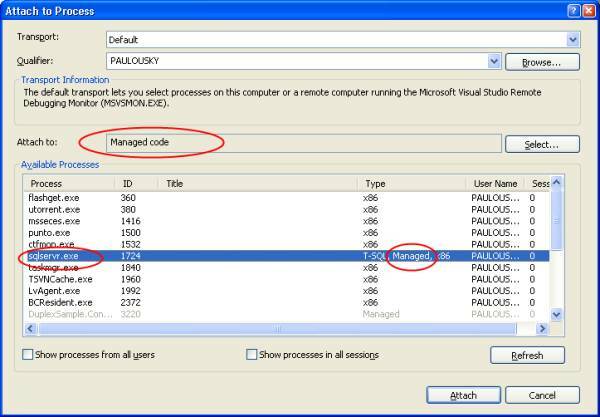 In order to use this feature you need to click CTRL + M or select “Include Actual Execution Plan” option from the Query Menu of SQL Server 2008 Management Studio before executing the actual code. 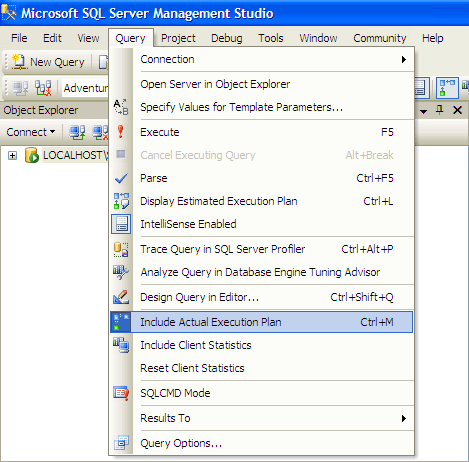 Let us go through an example by running the below mentioned T-SQL code in SQL Server 2008 Management Studio once “Include Actual Execution Plan” option is selected. The below T-SQL code needs to be run against Sales.Store table of the AdventureWorks database. Once the above T-SQL code has executed successfully, you need to navigate to Execution Plan tab as shown in the below snippet. SQL Server 2008 Management Studio will display information related to all the missing indexes in the Execution Plan tab for that particular T-SQL code. The best part of this feature is that you can even connect to an SQL Server 2005 instance from SQL Server 2008 Management Studio and get the information with respect to missing indexes. The information is shown from the data which is collected by the Dynamic Management Views since the last time the SQL Server 2008 or SQL Server 2005 instance has been restated. You can move the mouse pointer on top of Missing Index text and it will display the T-SQL code which is required to create the missing index as suggested by SQL Server 2008 Management Studio. A DBA can generate the T-SQL code to create the missing index by right clicking Missing Index text and then select theMissing Index Details… option from the drop down list. The T-SQL code below will be generated by the SQL Server 2008 Management Studio when the Missing Index Details… option is selected. The Query Processor estimates that implementing the following index could improve the query cost by 95.0908%. The associated cost benefit by adding the index is included. Be sure to review the query plan to validate the query is using the index and test the query with the new index as a portion of your change management process. Please note that the script does not include an index name, so this will need to be created based on your naming standards. Missing indexes can be a SQL Server performance killer. Be sure to review your query plans and determine if theindexes are appropriate or if they require additional attention. The missing index feature, is just one of many nice little features in SQL Server 2008 Management Studio. See what other tips are available with SQL Server 2008 Management Studio. Remember we were in a mission? Our mission was to optimize the performance of a SQL Server database. We had an application that was built on top of that database. The application was working pretty fine while testing, but soon after deployment at production, it started to perform slowly as the data volume increased in the database. Within a few months, the application started performing so slowly that the poor developers (including me) had to start this mission to optimize the database and thus, optimize the application. Well, in the first 3 steps (discussed in the previous article), we implemented indexing in our database. That was because we had to do something that improved the database performance in a quick amount of time, with the least amount of effort. But, what if our data access code was written in an inefficient way? What if our TSQLs were written poorly? Applying indexing will obviously improve data access performance, but at the most basic level, in any data access optimization process, you have to make sure that you have written your data access code and TSQLs in the most efficient manner, applying the best practices. Moving SQL from application and implementing them using Stored Procedures/Views/Functions/Triggers will enable you to eliminate any duplicate SQL in your application. This will also ensure re-usability of your TSQLcodes. Implementing all TSQL using database objects will enable you to analyze the TSQLs more easily to find possible inefficient codes that are responsible for the slow performance. Also, this will let you manage your TSQL codes from a central point. Doing this will also enable you to re-factor your TSQL codes to take advantage of some advanced indexing techniques (going to be discussed in the later parts in this series of articles). This will also help you to write more “Set based” SQLs along with eliminating any “Procedural” SQLs that you might have already written in your application. Despite the fact that indexing (in Step 1 to Step 3) will let you troubleshoot performance problems in your application in a quick time (if properly done), following step 4 might not give you a real performance boost instantly. But, this will mainly enable you to perform other subsequent optimization steps and apply other techniques easily to further optimize your data access routines. If you have used an ORM (say, NHibernate) to implement the data access routines in your application, you might find your application performing quite well in your development and test environment. But if you face performance problems in a production system where lots of transactions take place each second, and where too many concurrent database connections are there, in order to optimize your application’s performance, you might have to re-think about your ORM based data access logic. It is possible to optimize an ORM based data access routine, but, it is always true that if you implement your data access routines using TSQL objects in your database, you have the maximum opportunity to optimize your database. If you have come this far while trying to optimize your application’s data access performance, come on, convince your management and get some time to implement a TSQL object based data operational logic. I can promise you, spending one or two man-months doing this might save you a man-year in the long run! OK, let’s assume that you have implemented your data operational routines using TSQL objects in your database. Having done this step, you are done with the “ground work” and ready to start playing. Let’s move towards the most important step in our optimization adventure. We are going to re-factor our data access code and apply best practices. No matter how good indexing you apply to your database, if you use poorly written data retrieval/access logic, you are bound to get slow performance. We all want to write good code, don’t we? While we write data access routines for a particular requirement, we really have lots of options to follow for implementing a particular data access routine (and the application’s business logic). But, in most cases, we have to work in a team with members of different caliber, experience, and ideologies. So, while at development, there are strong chances that our team members may write code in different ways, and some of them will skip best practices. While writing code, we all want to “get the job done” first (most of the time). But when our code runs in production, we start to see the problems. Time to re-factor the code now. Time to implement the best practices in your code. I have some SQL best practices for you that you can follow. But I am sure that you already know most of them. Problem is, in reality, you just don’t implement these good stuff in your code (of course, you always have some good reasons for not doing so). But what happens at the end of the day? Your code runs slowly, and your client becomes unhappy. While you should know that best practices alone is not enough, you have to make sure that you follow the best practices while writing TSQL. This is the most important thing to remember. Unnecessary columns may get fetched that will add expense to the data retrieval time. The database engine cannot utilize the benefit of “Covered Index” (discussed in the previous article), and hence the query performs slowly. Selecting unnecessary columns in a Select query adds overhead to the actual query, specially if the unnecessary columns are of LOB types. Including unnecessary tables in join conditions forces the database engine to retrieve and fetch unnecessary data and increases the query execution time. When you use COUNT(), SQL Server does not know that you are doing an existence check. It counts all matching values, either by doing a table scan or by scanning the smallest non-clustered index. When you use EXISTS, SQL Server knows you are doing an existence check. When it finds the first matching value, it returns TRUE and stops looking. The same applies to using COUNT() instead of IN or ANY. When joining between two columns of different data types, one of the columns must be converted to the type of the other. The column whose type is lower is the one that is converted. In this case, SQL Server converts the integer column to float, because int is lower in the hierarchy thanfloat. It cannot use an index on large_table.int_column, although it can use an index onsmalltable.float_column. Always access tables in the same order in all your Stored Procedures and triggers consistently. Keep your transactions as short as possible. Touch as few data as possible during a transaction. Never, ever wait for user input in the middle of a transaction. The database engine is optimized for Set based SQL. Hence, Procedural approach (use of Cursor or UDF to process rows in a result set) should be avoided when large result sets (more than 1000) have to be processed. Use inline sub queries to replace User Defined Functions. Use correlated sub queries to replace Cursor based code. If procedural coding is really necessary, at least, use a table variable instead of a cursor to navigate and process the result set. For more info on “set” and “procedural” SQL, see Understanding “Set based” and “Procedural” approaches in SQL. This query will perform a full table scan to get the row count. Dynamic SQL is hard to debug and troubleshoot. If the user provides the input to the dynamic SQL, then there is possibility of SQL injection attacks. Unless really required, try to avoid the use of temporary tables. Rather use table variables. In 99% of cases, table variables reside in memory, hence it is a lot faster. Temporary tables reside in the TempDb database. So operating on temporary tables require inter database communication and hence will be slower. Full text searches always outperform LIKE searches. Full text searches will enable you to implement complex search criteria that can’t be implemented using a LIKEsearch, such as searching on a single word or phrase (and optionally, ranking the result set), searching on a word or phrase close to another word or phrase, or searching on synonymous forms of a specific word. Implementing full text search is easier to implement than LIKE search (especially in the case of complexsearch requirements). Try not to use “OR” in a query. Instead use “UNION” to combine the result set of two distinguished queries. This will improve query performance. Better use UNION ALL if a distinguished result is not required. UNION ALL is faster than UNION as it does not have to sort the result set to find out the distinguished values. Store Large Object columns (like VARCHAR(MAX), Image, Text etc.) in a different table than the main table, and put a reference to the large object in the main table. Retrieve all the main table data in a query, and if a large object is required to be loaded, retrieve the large object data from the large object table only when it is required. In SQL Server 2000, a row cannot exceed 8000 bytes in size. This limitation is due to the 8 KB internal page size of SQL Server. So to store more data in a single column, you need to use TEXT, NTEXT, or IMAGE data types (BLOBs) which are stored in a collection of 8 KB data pages. These are unlike the data pages that store other data in the same table. These pages are arranged in a B-tree structure. These data cannot be used as variables in a procedure or a function, and they cannot be used inside string functions such as REPLACE, CHARINDEX, or SUBSTRING. In most cases, you have to use READTEXT,WRITETEXT, and UPDATETEXT. To solve this problem, use VARCHAR(MAX), NVARCHAR(MAX), and VARBINARY(MAX) in SQL Server 2005. These data types can hold the same amount of data BLOBs can hold (2 GB), and they are stored in the same type of data pages used for other data types. When data in a MAX data type exceeds 8 KB, an over-flow page is used (in the ROW_OVERFLOW allocation unit), and a pointer to the page is left in the original data page in the IN_ROW allocation unit. Do not call functions repeatedly within your Stored Procedures, triggers, functions, and batches. For example, you might need the length of a string variable in many places of your procedure, but don’t call the LEN function whenever it’s needed; instead, call the LEN function once, and store the result in a variable for later use. Do not use “SP_XXX” as a naming convention. It causes additional searches and added I/O (because the system Stored Procedure names start with “SP_”). Using “SP_XXX” as the naming convention also increases the possibility of conflicting with an existing system Stored Procedure. Use “Set Nocount On” to eliminate extra network trip. Use the WITH RECOMPILE clause in the EXECUTE statement (first time) when the index structure changes (so that the compiled version of the Stored Procedure can take advantage of the newly created indexes). Use default parameter values for easy testing. Try to avoid the use of triggers. Firing a trigger and executing the triggering event is an expensive process. Never use triggers that can be implemented using constraints. Do not use the same trigger for different triggering events (Insert, Update, Delete). Do not use transactional code inside a trigger. The trigger always runs within the transactional scope of the code that fires the trigger. Use views for re-using complex TSQL blocks, and to enable it for indexed views (Will be discussed later). Use views with the SCHEMABINDING option if you do not want to let users modify the table schema accidentally. Do not use views that retrieve data from a single table only (that will be an unnecessary overhead). Use views for writing queries that access columns from multiple tables. Prior to SQL Server 2005, after BEGIN TRANSACTION and each subsequent modification statement, the value of @@ERROR had to be checked. If its value was non-zero, then the last statement caused an error, and if an error occurred, the transaction had to be rolled back and an error had to be raised (for the application). In SQLServer 2005 and onwards, the Try...Catch block can be used to handle transactions in TSQL. So try to useTry...Catch based transactional code. Try to avoid nested transactions. Use the @@TRANCOUNT variable to determine whether a transaction needs to be started (to avoid nested transactions). Start a transaction as late as possible and commit/rollback the transaction as fast as possible to reduce the time period of resource locking. And, that’s not the end. There are lots of best practices out there! Try finding some of them from the following URL:MSDN. Remember, you need to implement the good things that you know; otherwise, your knowledge will not add any value to the system that you are going to build. Also, you need to have a process for reviewing and monitoring the code (that is written by your team) to see whether the data access code is being written following the standards and best practices. How to analyze and identify scope for improvement in your TSQL? In an ideal world, you always prevent diseases rather than cure. But, in reality, you just can’t prevent always. I know your team is composed of brilliant professionals. I know you have a good review process, but still bad code is written and poor design takes place. Why? Because, no matter what advanced technology you are going to use, your client requirement will always be way much advanced, and this is a universal truth in software development. As a result, designing, developing, and delivering a system based on requirements will always be a challenging job for you. So, it’s equally important that you know how to cure. You really need to know how to troubleshoot a performance problem after it happens. You need to learn ways to analyze yout TSQL code, identify the bottlenecks, and re-factor those to troubleshoot performance problems. There are numerous ways to troubleshoot database and TSQLperformance problems, but at the most basic level, you have to understand and review the execution plan of the TSQL that you need to analyze. Whenever you issue a SQL statement in the SQL Server engine, SQL Server first has to determine the best possible way to execute it. In order to carry this out, the Query Optimizer (a system that generates the optimal query execution plan before executing the query) uses several information like the data distribution statistics, index structure, metadata, and other information to analyze several possible execution plans and finally select one that is likely to be the best execution plan most of the time. Did you know? You can use SQL Server Management Studio to preview and analyze the estimated execution plan for the query that you are going to issue. After writing the SQL in SQL Server Management Studio, click on the estimated execution plan icon (see below) to see the execution plan before actually executing the query. Each icon in the execution plan graph represents an action item (Operator) in the plan. 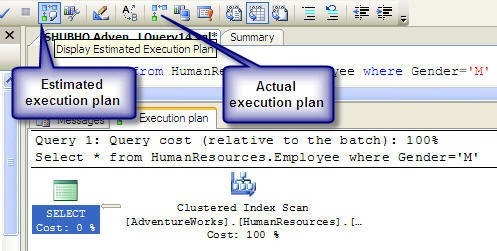 The execution plan has to be read from right to left, and each action item has a percentage of cost relative to the total execution cost of the query (100%). In the above execution plan graph, the first icon in the right most part represents a “Clustered Index Scan” operation (reading all primary key index values in the table) in the HumanResources table (that requires 100% of the total query execution cost), and the left most icon in the graph represents a SELECT operation (that requires only 0% of the total query execution cost). Note the “Query cost” in the execution plan given above. It has 100% cost relative to the batch. That means, this particular query has 100% cost among all queries in the batch as there is only one query in the batch. If there were multiple queries simultaneously executed in the query window, each query would have its own percentage of cost (less than 100%). This window provides detailed estimated information about a particular query item in the execution plan. 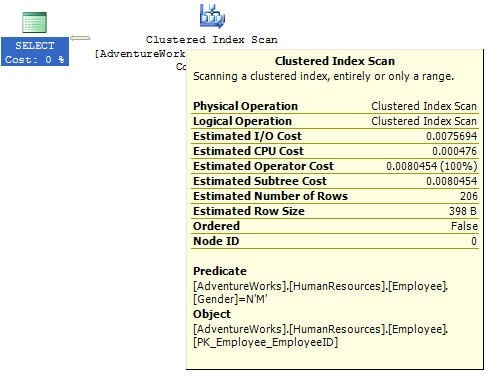 The above window shows the estimated detailed information for the clustered index scan and it looks for the row(s) which have/has Gender = ‘M’ in the Employee table in HumanResources schema in the AdventureWorks database. The window also shows the estimated IO, CPU, number of rows, with the size of each row, and other costs that is used to compare with other possible execution plans to select the optimal plan. I found an article that can help you further understand and analyze TSQL execution plans in detail. You can take a look at it here: http://www.simple-talk.com/sql/performance/execution-plan-basics/. What information do we get by viewing the execution plans? Whenever any of your query performs slowly, you can view the estimated (and, actual if required) execution plan and can identify the item that is taking the most amount of time (in terms of percentage) in the query. When you start reviewing any TSQL for optimization, most of the time, the first thing you would like to do is view the execution plan. You will most likely quickly identify the area in the SQL that is creating the bottleneck in the overall SQL. Keep watching for the following costly operators in the execution plan of your query. If you find one of these, you are likely to have problems in your TSQL and you need to re-factor the TSQL to improve performance. Table Scan: Occurs when the corresponding table does not have a clustered index. Most likely, creating a clustered index or defragmenting index will enable you to get rid of it. Clustered Index Scan: Sometimes considered equivalent to Table Scan. Takes place when a non-clustered index on an eligible column is not available. Most of the time, creating a non-clustered index will enable you to get rid of it. Hash Join: The most expensive joining methodology. This takes place when the joining columns between two tables are not indexed. Creating indexes on those columns will enable you to get rid of it. Nested Loops: Most cases, this happens when a non-clustered index does not include (Cover) a column that is used in the SELECT column list. In this case, for each member in the non-clustered index column, the database server has to seek into the clustered index to retrieve the other column value specified in the SELECT list. Creating a covered index will enable you to get rid of it. RID Lookup: Takes place when you have a non-clustered index but the same table does not have any clustered index. In this case, the database engine has to look up the actual row using the row ID, which is an expensive operation. Creating a clustered index on the corresponding table would enable you to get rid of it. Knowledge comes into value only when applied to solve real-life problems. No matter how knowledgeable you are, you need to utilize your knowledge in an effective way in order to solve your problems. Let’s read a real life story. In this story, Mr. Tom is one of the members of the development team that built the application that we mentioned earlier. Accordingly, Mr. Tom was assigned to optimize the Stored Procedure. The Stored Procedure’s performance was improved now, but still below the expected level (35 seconds). (Note the “with recompile” clause. It forces the SQL Server engine to recompile the Stored Procedure and re-generate the execution plan to take advantage of the newly built indexes). A table scan was taking place on a table while executing the query even though the table has a proper indexing implementation. The table scan was taking 30% of the overall query execution time. A “nested loop join” (one of three kinds of joining implementation) was occurring for selecting a column from a table specified in the SELECT list in the query. Curious about the table scan issue, Mr. Tom wanted to know if any index fragmentation took place or not (because all indexes were properly implemented). He ran a TSQL that reports the index fragmentation information on table columns in the database (he collected this from a CodeProject article on data access optimization) and was surprised to see that two of the existing indexes (in the corresponding tables used in the TSQL in the Stored Procedure) had fragmentation that were responsible for the table scan operation. Immediately, he defragmented those two indexes and found out that the table scan was not occurring and the Stored Procedure was taking 25 seconds now to execute. In order to get rid of the “nested loop join”, he implanted a “Covered index” in the corresponding table including the column in the SELECT list. As a result, when selecting the column, the database engine was able to retrieve the column value in the non-clustered index node. Doing this reduced the query performance up to 23 seconds now. Immediately after executing the query, Mr. Tom found that the query was taking 14 seconds now to execute. Exploring for further optimization scope, Mr. Tom decided to take a look at the column types in the SELECT list in the TSQL. Soon he discovered that a Text column (Products.DetailedDescription) was included in the SELECT list. Reviewing the application code, Mr. Tom found that this column value was not being used by the application immediately. 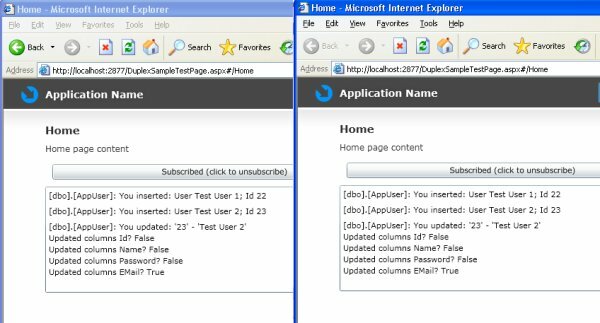 A few columns in the result set were being displayed in a listing page in the application, and when the user clicked on a particular item in the list, a detail page was appearing containing the Text column value. Excluding that Text column from the SELECT list dramatically reduced the query execution time from 14 seconds to 6 seconds! So, Mr. Tom decided to apply a “Lazy loading” strategy to load this Text column using a Stored Procedure that accepts an “ID” parameter and selects the Text column value. After implementation, he found out that the newly created Stored Procedure executes in a reasonable amount of time when the user sees the detail page for an item in the item list. He also converted those two “Text” columns to VARCHAR(MAX) columns, and that enabled him to use the len() function on one of these two columns in the TSQL in other places (that also allowed him to save some query execution time because he was calculating the length using len (Text_Column as Varchar(8000)) in the earlier version of the code. What’s next? All the optimization steps so far reduced the execution time to 6 seconds. Comparing to the execution time of 50 seconds before optimization, this is a big achievement so far. But Mr. Tom thinks the query could have further improvement scope. Reviewing the TSQL code, Mr. Tom didn’t find any significant option left for further optimization. So he indented and re-arranged the TSQL (so that each individual query statement (say, Product.ProductID = OrderDetail.ProductID) is written in a particular line) and started executing the Stored Procedure again and again by commenting out each line that he suspected for having improvement scope. Surprise! Surprise! The TSQL had some LIKE conditions (the actual Stored Procedure basically performed a keywordsearch on some tables) for matching several patterns against some column values. When he commented out theLIKE statements, suddenly the Stored Procedure execution time jumped below 1 second. Wow! It seemed that having done with all the optimizations so far, the LIKE searches were taking the most amount of time in the TSQL code. After carefully looking at the LIKE search conditions, Mr. Tom became pretty sure that the LIKEsearch based SQL could easily be implemented using Full Text Search. It seemed that two columns needed to befull text search enabled. These were: ProductName and Keyword. It just took 5 minutes for him to implement the FTS (creating the Full Text catalog, making the two columns full textenabled, and replacing the LIKE clauses with the FREETEXT function), and the query started executing now within a stunning 1 second! We’ve learned lots of things in optimizing data access code, but we’ve still miles to go. Data access optimization is an endless process that gives you endless thrills and fun. No matter how big systems you have, no matter how complex your business processes are, believe me, you can make them run faster, always! Notification Window is a Silverlight Out-of-Browser feature (among WebBrowser control, Elevated Trust and offline DRM) that allows your application to display a notification as a little pop-out window that disappear automatically. This is sometimes called a “toast”, and is similar to the Outlook live notification when new emails get in your inbox. The Notification Window is only available in Out-of-Browser (OOB) mode. You can take advantage of this feature to display confirmation of user’s actions (“Product saved”), application status (“Application updated, please restart”) or warn the user that data were refreshed while he is working on another application. Notification Window (”Now Playing”) used in a Silverlight Media Player app. How to use the NotificationWindow? The typical usage for the NotificationWindow visual is to create a UserControl to serve as the NotificationWindow.Content, so you can design the UI of the notification in Blend. But it could be something as simple as a TextBlock, or you could use a custom control which comes with its whole XAML graph (Canvas, Grid, Button, …) and code. The code for the CustomNotification custom control is available with the source code linked below. Maximum size for a Notification Window is: 400x100px. Currently (SL4) a Notification Window does not support transparency (for security reasons), no rounded corners as well. You can only style inside the content of the Window with your own control. The notification default to a blank background. You can’t have more than 1 notification at the same time (or you’ll get an InvalidOperationException), and the API does not provide a built-in queue mechanism. But nothing prevent you from building your own system to queue several notifications, and it’s fairly easy, see Tim Heuer post. No fade in/fade out like in Outlook right now. No transition/animation possible for the Notification Window itself. Silverlight always display the notification in the common location of your OS, on a Windows system it will appear in the lower right corner of the screen, on a Mac it is upper right. You can interact with a Notification Window but only with the mouse, no keyboard events. Also you can’t run actions like navigating from a HyperlinkButton, using SaveFileDialog or OpenFileDialog, accessing the Clipboard or switch to full-screen mode. The maximum duration for a notification is 30 seconds so that is NotificationWindow.Show(30000). There is a big class of software applications that should provide the ability for users to be notified about other user’s changes. The software for stock exchanges, medical practices, and clinics have to have the above mentioned feature. Silverlight applications are suitable for such areas because they have a rich interface and they are thin clients simultaneously. Fig. 1. Architecture of the application. If a client updates a particular data, then all other clients should be notified about the occurred changes. This means, between a middle and the client tiers should be established a two-way (duplex) connection. The middle tier should save data after receiving it from the client tier. A data tier is a layer that can say that data was saved successfully, and the last one should notify the middle tier about the changes. There should be a special table in the database which will be used for storing information about database changes. The middle tier should read it periodically for changes and notify the client tier about those. CLR SQL triggers can be implemented to notify the middle tier via a Web Service. Microsoft Notification Service can be used to notify the middle tier about database changes. I do not think the first variant is a good one. The middle tier is monitoring the database, sending requests all the time, and it’s a waste of resources. The third variant requires using additional software and I am leaving it for another article. I’m going to describe a second variant and unlock the secrets of building duplex Silverlight applications, CLR triggers, and using WCF services from CLR triggers. A Web application. It hosts the Silverlight application and the Web Services (see below). Silverlight application. This application will receive notifications about the database changes. CLR trigger. It will contain some logic for sending data from the trigger via a WCF service. SQL Server. Hosts CLR triggers. The Web application is a middle tier for the Silverlight application and is based on a standard template Silverlight Navigation Application (New Project/Silverlight/Silverlight Navigation Application). I am going to implement two WCF services. The first one (DBNotificationService) is intended for doing callbacks to the Silverlight application. The second one (DBAuditService) is intended for receiving data from CLR triggers. Why should I use such a complex schema and cannot use the client tier service (DBNotificationService) to notify the Silverlight applications directly? 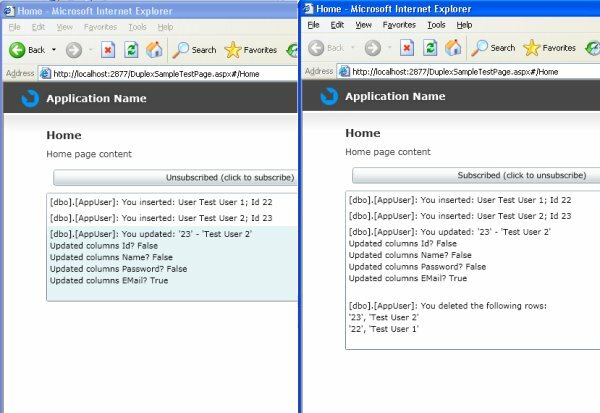 The answer is simple – Polling Duplex Binding mode is not implemented for non-Silverlight applications, and any other binding mode can’t be used for implementing a duplex channel. So, I decided to implement one more service. 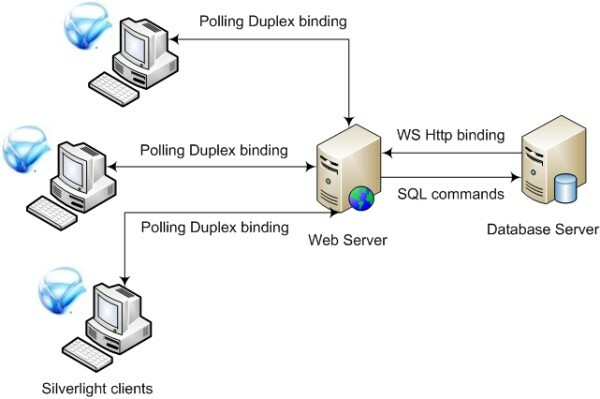 DBNotificationService is based on the Polling Duplex Binding protocol. This protocol allows to exchange data between the client tier (the Silverlight application) and the middle tier (the web application). DBNotificationService.svc. Contains the service metadata and is used for generating the source code (proxy classes/interfaces) for the client part of the WCF service. DBNotificationService.svc.cs. Contains the implementation of the WCF service. IDBNotificationCallbackContract.cs. Contains an interface for the callback contract. The method (void SendNotificationToClients(DBTriggerAuditData data)) will be used to send data from the middle tier to the clients. IDBNotificationService.cs. Contains an interface for the service contract that describes the methods that the client can call to subscribe (void SubscribeToNotifications()) or unsubscribe (void UnsubscribeToNotifications()) to notifications. This article is not a guide for WCF services, but I am going to describe the details of the implementation of the mentioned service. Implementation of the SubscribeToNotifications() method. I call the method above on the client tier to subscribe to notifications from the middle tier. The implementation of this method gets an incoming callback channel and stores it in the list; also, this one initializes other events (OnFault, OnDisconnect; see below) of the incoming channel. The stored channel will be used to send the notification to all clients. Implementation of the UnsubscribeToNotifications() method. I call the method above on the client tier to unsubscribe to notifications from the middle tier. The implementation of this method just deletes the callback channel from the list by its identification number. Initialization of the callback channel events; implementation of the ClientDisconnect method. These methods are executed when a client disconnects/is disconnected. ConcurrencyMode = ConcurrencyMode.Multiple means the service instance is multi-threaded and a developer should care about synchronization. So, I lock the list of Silverlight channels before reading/writing, to prevent inconsistency. InstanceContextMode = InstanceContextMode.Single means only one InstanceContext object is used for all incoming calls. DBAuditService is based on the WSHttpBinding protocol (BasicHttpBinding can be used as well). I am going to use this protocol to set a channel between the data tier (SQL Server database) and the middle tier. So, any changes in the database will be intercepted in the appropriate DB trigger, and the last one should send a notification about the changes to the middle tier using the stored channels (callbacks). DBAuditService.svc. Contains the service metadata and is used for generating the source code (proxy classes/interfaces) for the client part of the WCF service. DBAuditService.svc.cs. Contains the implementation of the WCF service. DBTriggerAuditData.cs. Contains a data contract (data transfer object) that will be used for exchanging data between the data/middle tiers and the middle/client tiers. This class contains two string properties. The first one contains the name of the table for which the trigger fired, and the second one contains the audit data received from the trigger. IDBAuditService.cs. Contains an interface for the service contract that describes the method that can be called to send audit data. The service implements only one method: SendTriggerAuditData. It enumerates all the client channels and executes the SendNotificationToClients method for each channel. The parameter for this method is data we received from the trigger. Implementation of the SendTriggerAuditData(DBTriggerAuditData data) method. Of course, it is not only Silverlight clients that can get notifications. One more service should be implemented to notify other clients about database changes. This service should use WSDualHttpBinding, and it should be implemented similar to theDBNotificationService service. In this case, DBAuditService should send notification using channels of non-Silverlight clients as well. 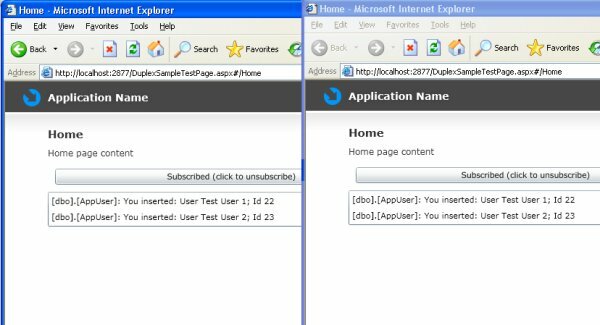 This Silverlight application is a client tier based on the standard template ‘Silverlight Navigation Application’ (New Project/Silverlight/Silverlight Navigation). The first one is a Button, and the user can use it to connect/disconnect from a server. The second one is aListBox, and it displays a text of incoming messages. In the constructor of the page, I just initialize the DBNotification service. SendNotificationToClientsReceived is an anonymous delegate that is executed when a message from the middle tier is received. The methods Subscribe/Unsubscribe just execute the corresponding method of the WCF service (SubscribeToNotificationsAsync/UnsubscribeToNotificationsAsync) and define the anonymous delegates that will be executed after finishing connecting/disconnecting. This project is a class library, and it contains just one class AppUser and a static method AppUserAudit. This method creates a message according to the changed rows and fields and sends it via the DBAudit service. The code for building a log was taken from the SQL Server documentation, and you can find a lot of information about this feature there. I just added into this method to send audit data via the service. Please pay attention that the address of the service is hard-coded. I am going to explain below why I did it. Create a trigger that is based on the CLR trigger. where [DuplexSample.SqlTriggers] is the name of the assembly within the database, and PERMISSION_SET = UNSAFE is the level of permissions for that library (see below for details). That’s all! Your trigger is ready to be fired. You can go to the appropriate table and try to change the data – the trigger will be executed, and the data will be sent via the WCF service. I have spent much time before the trigger started working well. I found out several issues, and now I am going to describe them to simplify the life of my fellows. First of all, a CLR trigger is loaded within the SQL Server process, and neither App.config nor other parameters (Assembly.Location, for example) of the assembly are available. So, I can’t even get the path to the assembly; therefore, all parameters of the WCF service should be hardcoded or indicated in a different way. By default, SQL Server does not allow to add unsafe assemblies even when TRUSTWORTHY is on, and I should use the special parameter (PERMISSION_SET = UNSAFE) to add the assembly to the database (see above). Note: Setting the database to trustworthy can cause problems with security, so it would be better to use the certificate/asymmetric key scenario (see here for details). The CLR trigger assembly has a lot of related assemblies, and they should be installed into SQL Server as well. SQL Server can install them automatically only if they are placed in the same folder as the CLR trigger assembly. I added all such assemblies to the CLR trigger project as references, and set the property Copy Local to true for each added assembly. See the project file DuplexSample.SqlTriggers.csproj for the list of added assemblies. If you change your CLR trigger, just rebuilding is not enough. You have to rebuild it, delete the trigger and the assembly from the database, and add them again. The debugging of CLR triggers is a very simple process. You need to just set a breakpoint, attach to thesqlserver.exe process (main menu – Debug – Attach to process), and try to change the table. The most amazing thing is, the web application (the server part of WCF services) can be debugged at the same time when you are debugging the CLR trigger. Fig. 2. Attaching to the SQL Server process to debug the CLR trigger. Sometimes, notifications do not come up to the Silverlight application – just restart the built-in web server. Sometimes, the Silverlight application crashes Internet Explorer (I do not know the reason) – use Firefox instead. Change the port number/create the IIS folder for the web project (if you want to use another port or IIS instead of the built-in web server). Create a database from the given scripts. To start a demo, I should compile all the libraries, add the CLR trigger to the database, run one or several Silverlight applications and subscribe to notifications, and do any change for the table for which the CLR trigger was created. Fig. 3. Two Silverlight applications are started, connected to the service and ready to subscribe to notifications. Fig. 4. Two Silverlight applications are subscribed to notifications and receive information about the insert operation. Fig. 5. Two Silverlight applications receive information about the update operation. Fig. 6. One Silverlight application is disconnected, a second one is connected and receives information about the delete operation. The application DuplexSample.ConsoleApp was added to the solutions just to have the ability to emulate the CLR trigger. This application connects to DBAuditService and sends test data. These data come to the web server and the last one sends them to each subscribed client. 4) Open up Device Manager and find “kindle”. It should have a yellow triangle near it. 6) Open up command prompt and navigate to wherever you saved fastboot to. 8) Power off your device by holding down the power button for ~10 seconds and turn it back on, and this time don’t hit the power button to go into TWRP. It should move past the yellow triangle after a few seconds and boot into Kindle. Hope this helps! I tried this and it won’t work, what am I doing wrong ? Why is there a step 4? Is it only there so I check if kindle shows up or do I have to update its driver so there is no yellow triangle anymore? So I managed to get it running. What I did is I added the “0x18D1” as in step 3 but after that I opened my device manager and by clicking on kindle (that has yellow triangle next to it) I updated its driver. I chose the location of adb_usb.ini that I edited. After that I ran Kindle Fire Utility and chose option 1 (Boot mode) and in the following menu I tried all of the options. In the option 3 (Recovery) it did something and now every time I boot kindle it goes to the yellow triangle but by pressing power button once it starts normal boot.